For those of you who aren’t familiar with the tool at all, just think of it as a miniature reciprocating saw — with a twist. That twist? Instead of a D-handle attached to the back of the tool, both the Hackzall and the PS60 make a pistol-style grip, pretty much like the one you find on drivers from the same line. This renders the whole tool much more compact, stowing the motor at an angle back above your hand. It also turns out to make the thing killer comfortable to use. Most of the time you grab the grip just like a driver’s, but then you end up putting your other hand on the back of the motor, allowing you to stabilize the thing or push like hell on it. Spec-wise, the similarities continue. Both are 11″ long and deliver 0-3,000 strokes per minute (SPM). The PS60 delivers a slightly longer stroke, though, at 4/7″ (0.57″) compared to the Hackzall’s 1/2″. This could be interesting, as the Milwaukee engineers made it clear to us back on the Hackzall launch that they specifically shortened the stroke in order to increase battery life — to give you more use from the little li-ion without really taking much away, taking into account the kind of jobs you’re likely to attack with this (instead of a standard recip). So I wonder if the longer stroke might impact battery life on the PS60. Both tools include a work light, and both weigh exactly the same. Tool-only pricing — which we suspect will be the most popular purchase form for this tool — start around $80 for the PS60 (known as the PS60B in this form) as compared to around $90 for the M12 Hackzall. We’re seeing the -2A variant (two batteries, charger, and case) for around $190. Note: Pricing seems to swing pretty widely online for both tools, so we recommend doing your shopping carefully. Regardless of which of these you choose, though, I can tell you this: You want to have one of these around if you can afford it. I use mine for all sorts of jobs. It’s like a Swiss Army knife. It may not be the best tool for the job, but it’ll work for all kinds of jobs. Darn it Chuck, quit spending my money. What I would like to know, when are DeWalt going to bring out an Oscillating Multi-Tool and a Hackzall? It is a bit funny how we’ve become slaves to battery platforms – much more so than anything that approached this with corded tools (like Porter Cable Bayonet Jigsaw Blades). Once you’ve bought into a platform – buying into another means inconvenience, different batteries, multiple charges etc. I consider my choices as dumb luck – because when we bought into the Makita LXT 18V line –for one line of business – we decided that the Milwaukee M12 lineup was better for another. As it turned out both of these tool lines expanded pretty well to meet our needs – and some of what we use (e.g. PEX expanders) in the M12 lineup are not duplicated elsewhere. I’ve no doubt that the Bosch 12V lineup includes decent tools – but we’ve been using M12 Hackzalls since we bought our first to try out (and liked it) in 2008. We would have likely foregone this tool if we had bought into the Bosch lineup. These aren’t really that new, I bought one @ Menards this Fall for $99.00 with 2 batteries and charger. Its fine for what it is but don’t expect too much out of the little fellow. I use it for cutting off toilet bolts, pipe in crawlspaces and what not. If your blade is not brand new you can forget about getting anything done with it. It does make a nice addition to my other Bosch 12v stuff. I wish they would make a Dremel style tool like Big Red does. Even better, a laminate trimmer that could double as a rotary tool via a collet adapter. I have the Milwaukee M12 version of this, and it’s a great little tool. Sure, if you’re doing some heavy cutting, the battery life isn’t great. But that’s not what it’s for. It’s for doing a few cuts here and there, and not having to lug around a full-sized recip. Also, for mine, I purchased the double sized battery. I have a few other M12 tools, so I’m fully invested in that lineup, and I highly recommend them. I have this, and with the HD BAT413, it does a pretty good job of going through most anything. I have sawed through extremely hard solid steel with diamond and bi-metal blades with little effort. It does take quite a bit longer than a full size recip saw, but the compact size is perfect for out-of-the way jobs or where a full size cordless won’t fit. Battery life is probably what you’d expect…not that great. I can get a few cuts in before the battery starts to go down, but after that, the cutting is rather slow and you’ll be there awhile. If you keep going, it eventually drains in short order. I find it’s great for making a few cuts, but that’s it. Then you either need to have a second battery ready to go, or recharge. I like it for my purposes. I had the Milwaukee M18 XC version, and sold it, but kept this. 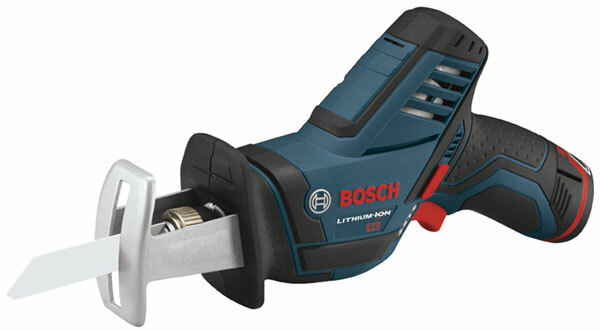 What Bosch REALLY needs to do is make an 18V Li-ion version to compete with Milwaukees, the same as they did with this in response to the M12 Hackzall. I’m an electrician and I have the Milwaukee Hackzall as well as a Ryobi 18v and a corded recip saw. I haven’t come across anything that I needed the Hackzall for that the 18v wouldn’t do better. I only use the Hackzall when my boss (who loves it for some reason) gets it out of the truck instead of the full size one. I bought one fairly recently, and I’m really happy with it. Its not as aggressive as an orbital saw(of course) and not as powerful as a corded one but it has no problem with 2x stock. If you hit a knot you may have to rock it slightly to get past it but it has enough power for most jobs. And I haven’t had a problem with battery life, I made about 12 cuts in a 2×4 continuously with no break in between and the fuel gauge showed 2/3 before and after. I mostly bought into the Bosch line instead of the Milwaukee because I liked how much shorter the driver was, even though Milwaukee has a better selection of tools.